DG3-3552-000-RIGHT COVER LCD ASSEMBLEY BLUE -L1. MADE BY CANON. 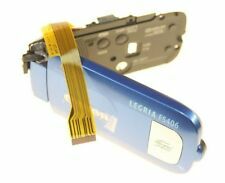 CANON LEGRIA FS406 CAMCORDER BLUE RIGHT LCD COVER ASSEMBLEY. THIS IS FOR THE BLUE VERSION OF FS406 CAMCORDER. MADE BY CANON. DG3-3680-000-RIGHT LCD COVER ASSEMBLEY (RED)- L1. MADE BY CANON. CANON LEGRIA FS406 SILVER CAMCORDER RIGHT LCD COVER ASSEMBLY. MADE BY CANON. DG3-3678-000-RIGHT LCD COVER UNIT-L1. CANON LEGRIA FS46 DIGITAL CAMCORDER RIGHT LCD COVER ASSEMBLEY. DG3-3676-000-RIGHT LCD COVER ASSEMBLEY - L1. ORIGINAL MADE BY CANON. DG3-3548-000-RIGHT COVER LCD ASSEMBLEY (SILVER)-L1. MADE BY CANON. CANON LEGRIA FS406 DIGITAL CAMCORDER (BLUE, RED OR SILVER) AND FS46 LCD SCREEN. MADE BY CANON. GENUINE SPARE PART. MADE BY CANON. GENUINE LCD PANEL. Genuine Sony. Are you buying the Right item?. This is a Sony HXR-NX5U FP-1149 Flex Circuit Board. Part number A-1752-133-A. Fully tested and works perfectly. Are you buying the Right item?. This mixer is capable of capturing high-quality recordings while in the field or on the go. Dual stereo condenser mics with 360° adjustable pattern. 2 x Condenser Microphones. Inputs 2 x 3.5 mm TRS jacks, 1 mini-XLR jack with mini to standard-XLR adapter. THIS IS FOR THE SILVER VERSION OF LEGRIA HF R106. MADE BY CANON. 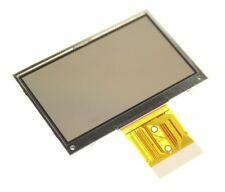 GENUINE LCD PANEL WITH COVER ASSEMBLEY. MADE BY CANON. GENUINE AND ORIGINAL SPARE PART. CANON LEGRIA FS36 CAMCORDER RIGHT LCD COVER ASSEMBLEY. DG3-3546-000-RIGHT COVER ASSY WITH LCD -L1. 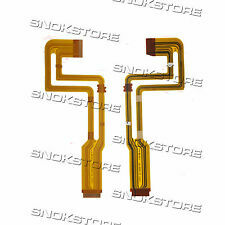 LCD IS ALSO SUPPLIED. GENUINE AND ORIGINAL SPARE PART. 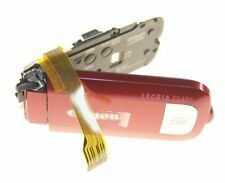 CANON LEGRIA FS306 RED CAMCORDER RIGHT LCD COVER ASSEMBLEY. MADE BY CANON. DG3-3550-000-RIGHT COVER LCD ASSEMBLEY(RED)- L1. Used original Canon XHA1S Part Battery Box Works Used. We are a Sony and Canon camcorder repair service center. It is used however it is fully working. This part has been fully tested and works 100 percent. Genuine Canon XL1 3CCD Video Camcorder Lens 16x Zoom XL 5.5-88mm IS II 1:1.6-2.6 Optical Image Stabilizer. 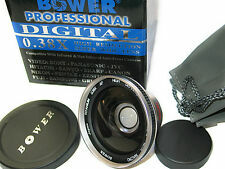 This Canon XL1 Video Lens 16x Zoom XL 5.5-88mm IS II Parts is used and is in great working condition. CANON MD150 CAMCORDER LEFT COVER ASSEMBLEY. MADE BY CANON. GENUINE SPARE PART. PICTURE OF ACTUAL ITEM. We don't allow photos with extra borders, text or artwork. Saving image. Are you buying the Right item?. Genuine Canon XL1 3CCD Digital Video Mini DV Camcorder Body with Hand Strap and Mount Holder. This Canon XL1 3CCD Digital Video Mini DV Camcorder Body with Hand Strap is used and is in great working condition. No other accessories included, only the item in the pictures. The box might be opened. language only. This item is a Sony HXR-NX3 PI-1002 Circuit Board. Part number A-1994-376-A. Fully tested and works perfectly. Very Good Used Condition. Are you buying the Right item?. 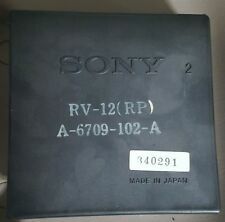 Sony Prism DCR VX2000 part A-7031-100-A, new in box. CCD-NTSC Pd Car Color CAMERA Lot Of 10 Condition is Used. Shipped with FedEx Ground or FedEx Home Delivery. This is only the red locknut repair part, no other parts, pieces, tools or instructions. I do my best to cut the pieces to 3mm long to match the original genuine Sony part from my unit. There are many videos on YouTube on how to do this repair, but I had to search many tubes to find the one that would work. This is a Canon XL2 Part Main PCB Circuit Board. Are you buying the Right item?. We have for sale:OEM Original Genuine Sony ECM-DS70P Condenser Microphone Mic. Function status of the Item: Works good. This is a HVR-Z1u and HVR-Z1J SONY Component Video Cable. Genuine Sony. Are you buying the Right item?. Original Sony PXW-FS5 LCD Block that fits on the the Sony PXW-FS5 (also works with the Fs7) camcorder. It is a genuine Sony part, sourced directly from Sony USA. Genuine Canon XL1 3CCD Video Camcorder Lens 16x Zoom XL 5.5-88mm IS 1:1.6-2.6 Optical Image Stabilizer with Canon Lens Hood. This Canon XL1 Video Lens 16x Zoom XL 5.5-88mm IS Parts is used and is in great working condition. This Sony LCD Board & Cover Parts is used and is in great working condition. This product is genuine original. Product Images Gallery. These are genuine Canon parts for the XL2 Viewfinder. Included in this lot are: YN1-3114-000 - CVF Lens G3, YN1-3112-000 - Lens CVF G1, DA3-1822-000 - CVF Top Cover, DA3-1819-000 - CVF Rear Cover, DA3-1872-000 - CVF Stopper, DF1-5093-000 - CVF Front Cover, DA3-1821-000 - CVF Bottom Cover, DA3-1857-000 - Microphone Holder Block, and DG3-0647-000 - CVF Cable Assembly. This item is a genuine Sony mic holder sourced directly from Sony USA. Genuine Sony. Are you buying the Right item?. 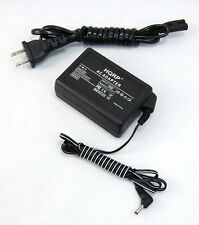 AG-HVX200 AG-HVX200A HVX200AP. We speak Spanish. VERY GOOD CONDITION. We are a Sony and Canon camcorder repair service center. Genuine Canon XL1 3CCD Digital Video Mini DV Camcorder Body with Hand Strap. This Canon XL1 3CCD Digital Video Mini DV Camcorder Body with Hand Strap is used and is in great working condition. This product is genuine original.